Hi, my name is Kelly. I recently graduated college in Washington, D.C. I was particularly interested in art museums and plans to pursue a career expanding access to the visual arts. I’m passionate about education and its transformative power. Working with kids is a very important part of my life. I love to ski, read, and spend time outside, whether it’s exploring nature or wandering around the city. My two big dogs look more like mops than animals. Mac & cheese is a staple in my diet. I order it any chance I get and dream of keeping track of it all in a food journal, but I won’t bore you with that on this blog. Do you wish you were cooler, more attractive, smarter, or more athletic? You’re not alone! Unrealistic images and messages from social media, TV shows, movies, books, and magazines all make it easy for teens to get caught up in a never-ending comparison game. But comparing yourself to others can also lead to feelings of unworthiness that get in the way of your happiness. So, how can you stop focusing on your flaws and embrace who you really are—someone who is truly awesome. Just As You Are is packed with simple ways to help quiet your inner critic, overcome feelings of inadequacy, and love show you are. You’ll find powerful mindfulness and self-compassion tools for dealing with negative thoughts and feelings, and tips for pursuing things you love and value most. With this book, you’ll learn to move past your “imperfections,” celebrate your true strengths, and go after what really matters in your life. Our relationships with others are an incredibly important part of our lives. I believe productive communication is essential to building and maintaining healthy relationships. Technology and social media have changed the way people communicate, particularly among teens. However, I believe that successful relationships are dependent upon our ability to connect with people face-to-face. Communication Skills for Teens provides the guidance you need to become a better communicator and succeed in all areas of your life. 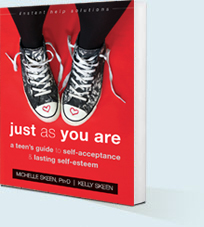 Each chapter focuses on one key aspect of communication, offers a real teen’s perspective (mine! ), and includes practical exercises to help you apply what you’ve learned. This week I appeared on my mom’s radio show, Relationships 2.0. We discussed our book Communication Skills for Teens: How to Listen, Express and Connect for Success. As teens head back to school, we thought it would be a good time to revisit and reinforce healthy communication skills. Above all, we had a lot of fun chatting and telling stories. Check it out here! I’m sharing an article below titled “The Joy of Missing Out.” It’s written by Dr. Christopher Willard, author of Growing Up Mindful. He was recently a guest on my mother’s radio show. You can find that podcast here. I was flying to a mindfulness conference recently when I looked down to my tray table. My Macbook formed the base of a neat pyramid of trendy technologies, with my iPad on top of the laptop, and my iPhone resting on the iPad. It took a moment before I realized the absurdity: I’m off to talk about the importance of staying in the moment and have no less than three gleaming Apple products sitting in front of me just to get through one cross-country flight? Sure, it was funny, but my next impulse was to take a picture and share the moment online. There’s nothing inherently bad or good about technology. Technology just is. How we relate to it and what we do with it are what matters. But our phones are not designed to be neutral, they are created to keep us hooked with texting, shopping, and sharing data with marketers, corporations, and even government agencies…oh, and our friends and family, too. I’ve heard it said that a thinking mind can be our most powerful servant or our most terrible master. The same could well be said of our technology, which more often disconnects us from others and ourselves that connects us. And, our phones and devices are addictive, in a very literal sense. Our beeps and alerts arrive on what behaviorists call a “variable rate reinforcement schedule.” The term essentially means that our phone’s random buzzing throughout the day acts as a little reward for the brain, which is rewired to crave more. Video games, slot machines, and even our phones are often designed by psychologists to maximize their addictive qualities. This explains why we see kids (or catch ourselves) mindlessly refreshing email and social media feeds. Our devices hold out the false promise that there is something more important, more urgent, more interesting than our present-moment experience. Unfortunately, while that statement makes rational sense, it is not going to hold much water with a nine-year-old clutching an iPad, or a tween on snapchat. We can tell kids that they need healthy boundaries around screen time, or we can show them with our own actions, which is far harder but far more effective. I’m as guilty as anyone else; I love my gadgets and my social media. Ask yourself, how long do you spend in the morning checking in with yourself and your loved ones in person before you tap the glowing screen of your phone? Where is your phone right now? How do you feel when you don’t know where it is? Do you usually keep it in your pocket, your bag, your desk, another room? When we teach children to disconnect from their experience with digital distractions, by modeling that behavior ourselves, it is no wonder they never learn basic emotional fluency, attachment, and social cues. They don’t learn that emotions and urges arise and pass, and that human beings actually can tolerate discomfort. Sherry Turkle, who writes about technology says “If we don’t teach our kids to be alone, we will teach them to be lonely.” Explicitly and implicitly, the way we live and the media we consume are teaching all of us to be lonely, to be too busy to attend to our needs, and to deal with emotions through looking outside of ourselves, rather than looking inside at the first twinge of discomfort. Running counter to all of the checking out, mindfulness teaches us how to be with ourselves, a capacity for being alone. Mindful curiosity reveals that the present moment is both important and interesting. Checking in with the pleasant, the unpleasant, and the neutral aspects of our experience and the world around us is profoundly worthwhile. With mindfulness, we look inward, get in touch with the internal experience, tolerate it, and maybe even learn from it. In this way, we become happier and healthier. Mindfulness teaches us not only how to be alone, but how to be in authentic connection with others as well. When we are intentional about taking time off from technology, we may face resistance at first. One family I work with turns off the wireless router for much of the day, and if the kids want the Internet, they plug in the old-fashioned way, with a cable. Since there is only one room where the cable can be connected, this rule at least keeps family members in the same room, and it makes connecting to the Internet an intentional act, not something done merely due to boredom. Other families and institutions have set hours when the Internet is on or off, or they have virtual quiet rooms where the router blocks access to some sites. Others set specific days or hours to be “technology sabbaths” or “phone-free Fridays,” when we can truly be present for ourselves and those around us. Time away from technology has been shown to have significant benefits to social skills,⁠ as well as reducing stress. Kids often worry about FOMO, the fear of missing out, but increasingly talk about the relief of unplugging and JOMO—the joy of missing out. Establish tech-free times, such as the hour before bed or the first hour after waking up. Designate tech-free places, such as the dinner table, the car, the family room, or staff meetings. Try leaving your phone in the car or in your bag, rather than your pocket, while you run errands. Establish wireless hours and wired hours within the home, and check with your provider about how to shut down non-emergency use of devices during certain hours. Lobby for virtual quiet rooms, where chat functions or social media are blocked, within schools, libraries, and other public venues. Only check messages when you can actually respond to them. Deliberately interact with people: ask someone for directions, chat with the shop clerk, and say hello to someone next to you rather than immediately looking into your phone. 1) When you pick up your gadgets, do it mindfully. Each time you look at your phone it’s an opportunity for a short mindfulness practice to check in first. The beeps and buzzes of our devices can also be reminders to take a breath or check in with ourselves. Mark Epstein, a psychiatrist and writer, even suggests sometimes not shutting off the cell phone when you meditate. Instead, just sit in meditation and notice the body’s and the mind’s reactions to each beep and buzz of the phone, the stories and urges and emotions as they arise. The objects of attention become our emotional response to the silence (anticipation, relief), our emotional response to the beeps, chirps, songs, and buzzes as they arise (irritation, curiosity, anxiety), and whatever urges arise due to the sounds. 2) Build mindful reminders into your devices. Make the background wallpaper some kind of reminder to breathe or check in. How many times a day do we type a password into our devices? This too can be a reminder if we make our password breathe or something similar. My friend Mark Bertin suggests putting calm images like beach scenes on your most annoying contacts or difficult people. There are also plenty of free websites, apps, and podcasts offer guided meditations and discussions of meditation as well. Other software and hardware teach basic mind/body principles through biofeedback and neurofeedback. Plug-ins for browsers can block certain websites and distractions for chosen lengths of time. Shut off automatic passive alerts and push notifications, and instead make the active choice to check in with messages and updates. 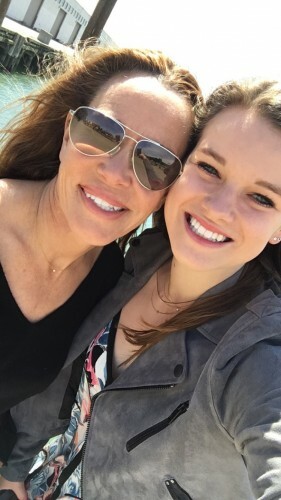 Here’s a blog post from fitness professional and transformation coach Molli Surowiec entitled “Saying Yes to New Experiences” about my mom’s adventure climbing Mount Kilimanjaro! Check it out below. “When it comes to new experiences, do you have a habit of saying yes? Or a habit of saying no? Do your daily choices support a life of openness, adventure, and growth? As we kick-off a new month, I’m sharing a story that can inspire all of us to get out of our comfort zones, on and off the bike. To an awesome, kickass month. 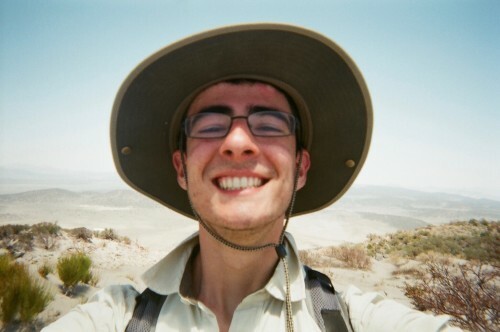 Two years ago, I trekked alone into the desert of Southeastern California and set up camp miles away from civilization. 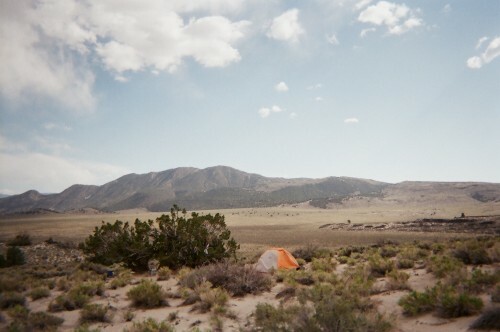 I stayed there for a week, isolated from technology and the comforts of modern living. I didn’t see another human for three days and nights. I had just concluded my term as high school Student Body President and was graduating with honors, seemingly ready to take college and the real world by storm. But I felt empty inside, so exhausted by my full-speed push through high school that I feared I would enter Georgetown University in the fall as a hollow version of myself. So I did something radical, signing up for my high school’s Vision Quest program to allow myself to reflect on where I had been, where I was going, and what was important to me. It was the most difficult week of my life, but spending time alone in the desert allowed me to reconnect my outer self with the inner energy that I had lost in the chaos of my day-to-day life. But these traditions each speak to something fundamentally human about spending time in the natural world, and recent science is backing that something up. Last year, researchers at Stanford University monitored the brain activity of people walking through a park in comparison with people walking through an urban environment, and unsurprisingly found that the people walking through the park had noticeably lower blood flow to the parts of the brain associated with stress than their urban counterparts. “If I had to give advice,” commented Gregory Bratman, an author of the study, “make time for yourself to interact with parks. Look at natural landscapes. It may help with stress.” What Bratman found was the same thing that Christian mystics found in the mountains of France a millennium ago and that I found in the desert of California two years ago: that spending time in nature is, simply, good for you. So if it’s objectively good for us and it’s rooted in our traditions, why aren’t we doing more of it? Because we’re busy. Perhaps that’s a sad statement about the priorities of our society, but if so then I’m guilty of the same sad prioritization; two years after my Vision Quest, I again find myself filling my schedule with classes and club meetings, living a life that is both phenomenally productive and phenomenally removed from the natural world. There is almost nowhere more distant from the desert of California than the streets of Georgetown. I’m making a commitment to get outside. Will you join me? This week, I appeared on The Real Side with Joe Messina representing the “millennial perspective” on a number of topics, including student activism, free speech, and safe spaces. I’m excited to announce that I will be coming on Joe’s show weekly to talk about relevant issues and current events. You can listen live on his website—I’ll be on the show Monday nights from 9:15-10:00 PM Eastern time. Check out a podcast of my first show HERE! Joe takes the issues, especially the controversial issues (politics, prejudice, religion, illegal immigration), and brings in people from different sides to share their viewpoint. This is definitely not a fluff piece. And while no one is attacked, the questions are hard-hitting. But the conversation is always respectful and you’re sure to learn something new, even if you don’t agree! If you’ve always wondered how the “other side” thinks and how they’ve arrived at their “stand”, then this is the show for you! It’s not the right side, it’s not the wrong side, but the REAL side of the issues! In our book, Communication Skills for Teens: How to Listen, Express and Connect for Success, we discuss family communication. Communicating with people you know very well can be tricky. For example, it can be easy to make assumptions based on your past experiences with them. As we grow up, we change and our relationships change, especially between parents and children. 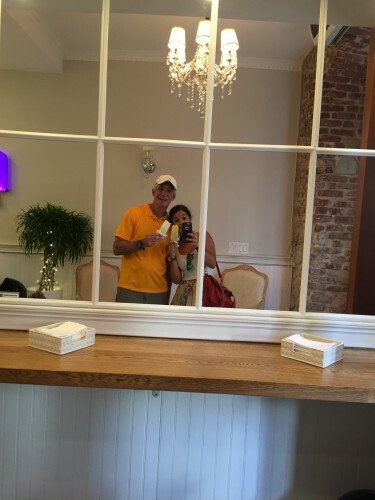 Thank you to Robert and Penina Remler for giving us a window into their father-daughter relationship and how they’ve grown together! Today, you can find my dad and I bonding over our overlapping obsession for all things music, food and most recently— social media related. However, the truth is, it wasn’t always this way. It took a good 19 years to get to where we are now, but lately, I owe a lot to our complex relationship. While our bond took much longer to build than my instant connection with my mom (who, as a female, just seemed to get it), my dad completely reshaped my perception of patience, making all the difference in my life moving forward. And, fortunately— that’s not the only thing my Dad has taught me. He have taught me that I can’t stand the sound of hearing other people chew at the dinner table (including himself), but he also taught me that a family who eats together— stays together. He taught me that cell phones at the dinner table are at risk for being taken away and/or broken, but he also taught me how important it is to surround oneself around genuine dialogue, which includes people who genuinely listen. He taught me to stop and slow down as he occasionally would cut me off mid-story, but he also taught me to think about others when speaking and not just hearing my own voice. Consequently, he taught me to listen. He taught me that the driver has control over the radio, which as a kid was a bummer during carpools, but he also taught me jazz, podcasts, and an appreciation for bands like the Grateful Dead and Allman Brothers whose posters hang up on my wall today. He taught me sticks and stones may break my bones, but words may never harm me. He taught me the torture of having to spend an afternoon searching for what we assumed was a stolen car, but he also taught me (upon finally finding it), that everything does work out in the end. It is safe to say that I tried to fight my dad on just about everything growing up, and now that I think about it— most of the time— he was right on point. Maybe it took longer than expected Dad, but you were right— we can’t go ahead and spend our lives sweating the small stuff. Think You Know How to Raise a Daughter? Barry Bonds sure does. That’s the year Barry hit his 715th homerun. And, Mr. You’llNeverFindMeonAWheaties box wasn’t the only one who has a memory from ten years ago. So, who cares about that stuff? Penina, our daughter was nine years of age in 2006 and I was fifty years of age. She called me Dad back then (and still does), but I am surprised she didn’t call me Stalin. Yo readers, can someone please Facetime Barbara Streisand and tell her to start singing: “What Kind of Fool Am I.” Please, only Barbara’s voice will soothe the anguish I’ve carried around for ten years. But, don’t feel sorry for me. I’m not looking for sympathy, a pat on the back. The important takeaway is that even though I got it wrong our daughter got it right. And that’s what men need to know about raising a daughter. Somehow a nine-year-old fifth grader becomes a nineteen-year-old college sophomore whether she sits up straight or not. More importantly, that fifty year-old Stalinesque man eventually realizes that no amount of rules buys anyone a Metro Card on the subway. Yup, there it is not once, but twice. Today, I’d like to share some great advice written by a friend and role model of mine, Molli Surowiec. 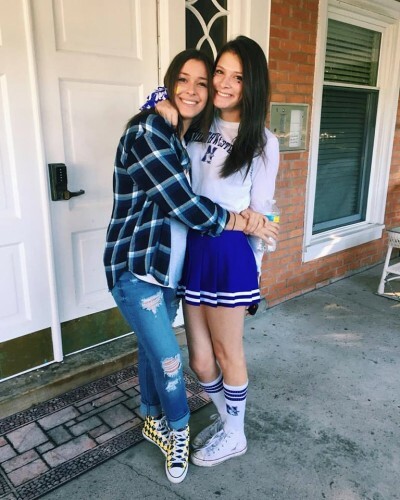 Last month, Molli wrote a blog post entitled “When We’re Off Our A-Game.” I stumbled upon her post this past week, at a time when I was feeling derailed and off my A-game. Molli begins her post by saying that various things, like an especially busy workweek or a negative interaction, can throw us off. “We all have those days, or even weeks. Knowing that, how can we return to a place of love more quickly – both with ourselves and others?” Asks Molli. “Drop an F-bomb”?! Molli challenges her reader to “make forgiveness your new favorite F-word” and “forgive choices that haven’t been serving you or uplifting you.” This really resonated with me. Molli explains that forgiveness “is about releasing the past so we can return to love – and living – in the present.” It is easy to get wrapped up in negative emotions and fail to see a way to move forward. When you’re off your A-game, show yourself the compassion you deserve, be forgiving, and follow through with practices that make you feel happier and stronger. Check out Molli’s website here, where you find also find awesome fitness and food inspiration! Most sophomores in college have no clue what they want to do this weekend, let alone for the next 20 years. In the age of millennials and indecision, it’s rare to find a student who is ready to break into the workplace and has been since she was a sophomore in high school. That was me. And for all of you out there who are struggling to find a major or even an interest, I’m not trying to brag. I know that finding your passion at such a young age is a blessing, so I took advantage of it. At 15, I found myself enamored with journalism. Constantly reading newspapers, scanning magazines. I knew I wanted to be a part of it and I knew I had to start my journey to the editor’s desk. I hit many obstacles on the way. My high school didn’t even have a newspaper, let alone a journalism class. I took two steps to get passed this. I emailed the editor of my town newspaper and my school principal. Within a week I was writing an article for the Easton Courier and starting an online journalism class financed by Joel Barlow High School. I still remember picking up a copy of the Courier and seeing my name in print for the first time. At that moment, I knew I was on the right path. That article lead to another, and then another. Finally I asked Nancy, the editor of the Courier, to get coffee. A short conversation ended in an internship with a weekly column. I was seeing my name in print almost every week, and I still got butterflies every time. Unfortunately, the online journalism class I enrolled in was not as fulfilling as I hoped. This led me to seek out a more expansive education, so in the summer of 2013, as my friends laid on the beach and traveled the world, I applied to and attended the Medill-Northwestern Summer Institute where I spent five weeks in an intensive journalism program honing my skills. Surprisingly, or maybe not so surprisingly, it was one of the best summers of my life. As I sat in class for hours everyday, writing leads and practicing interviews, I knew I wouldn’t want to be anywhere else. Now, it’s 2016, I’m 19 and I sit at the library, at Northwestern University, right after my journalism class at the Medill School of Journalism. Not a five-week summer intensive, but a four-year bachelors program. Since I was 15 I dreamed of sitting in this library and I made it happen. Don’t ever think it is too early to start preparing for the future. If you’re lucky enough to find your passion at a young age, get that head start. While I may not be the editor of Entertainment Weekly or Time Magazine yet, I’m a hell of a lot closer than I was four years ago. ^ There’s Carolyn on the right, sporting NU with pride! Find out more about Carolyn (and read her work!) here. Happy Monday! My mom and I had a great time talking on a few radio shows this past week. 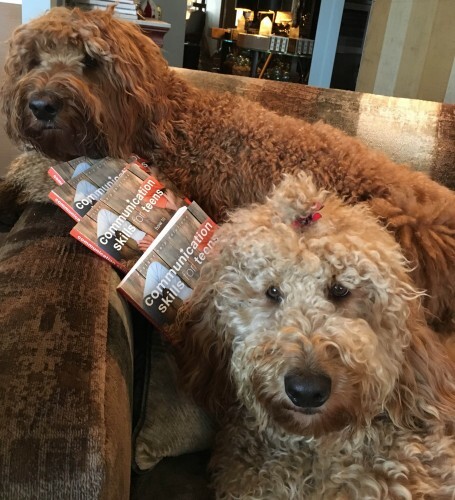 Listen below to learn more about the book! Hi, and welcome to my blog! My name is Kelly and I co-authored a book called Communication Skills for Teens: How to Listen, Express & Connect for Success. 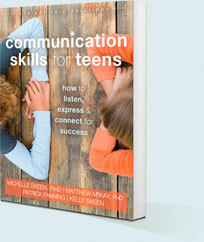 I believe our book is an awesome resource for teens to improve our communication skills in every area of our lives. However, the work doesn’t stop there! I’ll be sharing posts on my blog covering a wide range of topics that impact our lives as teens. And these posts won’t just be written by me—I am looking forward to sharing stories and advice from great guest bloggers! At first, these stories will come from my friends, but my goal is to receive submissions from anyone who would like to contribute. It’s important to recognize that while we all struggle, we can help each other through difficult times by sharing our experiences. Let’s go on this adventure together!